Well, at least he got to rule Centauri Prime... not surprising, since he was a very prolific guy. I saw it too. I thought it showed promise, and watched them all on first airing. I think it was about ep5 when I was hooked. Yep, sad to say that there's as many spambots as regular posters here any more. If only JMS would do something new! Aha! Kribu is back... Yes, I think these films have been good. I particularly liked how they managed to use so many characters effectively in The Avengers. I saw on the news that Ford would be willing to play Han again. While I have no great expectations for VII - IX, they could easily be better than I - III. I'd liked him as an actor for years, when he played on B5. And, I liked his character and performance on B5 very much. He does seem to have had a long and full life. 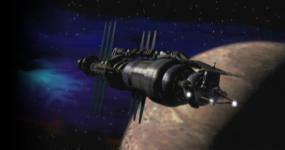 Upconverting Babylon 5 DVD's to 1080i/1080p? Re: Upconverting Babylon 5 DVD's to 1080i/1080p? Yes, I know they use a disc, but OPPOs might also accept firmware from a flash drive. Someone posted on the AVS forum, "Does everyone from that show die young?" That seems all too close to the truth. It's very sad. And PBS still hasn't shown it! Aarrggh! The Centauri seemed rather Roman to me, or perhaps Italians from late dark ages to the early Renaissance. Captain Marvel, drawn by Jim Starlin, was one of my favorite Marvel comics, so I recognized him. They even gave Starlin a nod in the credits. To me, further is farther still, that is first something is far, then farther, then further. That sounds about right for season 1. It was very few. I'm hoping that season 2 will be on PBS before too long. I don't know how many eps in season 2. I recently saw Hugo, which I highly recommend. A magical film, with great use of 3D. Yeah, I think it was only a fair ep. Last year's Christmas Special was better. That's great! Thanks for posting this! Or Danny Glover as G'Kar and Mel Gibson as Londo? This'll encourage more Kirk/Spock slash fanfics. Re: This'll encourage more Kirk/Spock slash fanfics. Okay, I understand what you guys are saying, but I don't buy it. I don't think that would have destroyed the continuity of time, if it wasn't the Doctor, or some other important being. Well, if you realize that Cartagia is a take-off on Caligula, and how Caligula feared any offspring of his would rival his own godhood, it's not so strange. More B5 on the way? Re: More B5 on the way? I certainly hope his enthusiasm is warranted! Looks good! Looks like a lot of work, and a lot more yet. Just scroll up a bit. It was Jan's description of Londo and G'Kar's tryst.